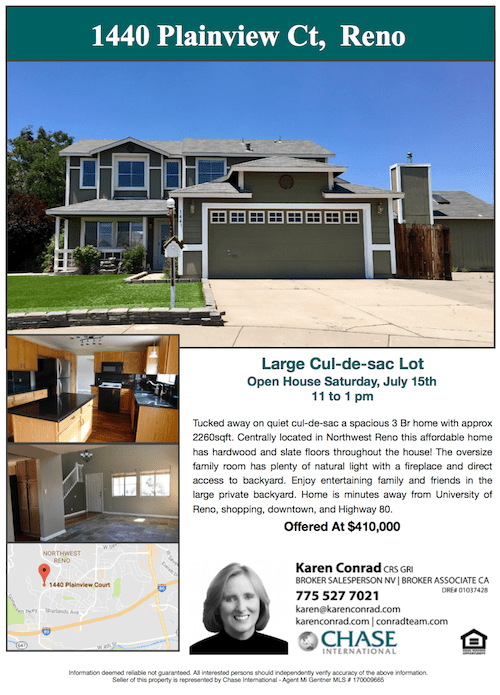 North Valley Open House Reno at 7177 Beacon Dr., Reno – This spacious four bedrooms two and a half baths North Valley Reno home is perfect for family living with over 2800 square feet of living space and a three-car garage. It is a short drive to the University of Reno, TMCC, downtown Reno and easy access to Hwy 395. The master bedroom is conveniently located downstairs with a master bath with a deep soaking tub, separate shower, double sinks, and walk-in closet. The kitchen has plenty of cabinets with a pantry with lots of storage, an island, electric oven, range, and refrigerator to make it a fun place to cook. For comfortable living and cleaning, there are laminate floors in living and dining rooms. Additional bonus room upstairs, other quality features include tile roof, three car garage with openers and storage shed. This North Valley Reno home has plenty space for entertaining Family & Friends. Right now is an excellent time to buy a home in Reno’s North Valley. With all the new companies setting up shop in the Reno – Tahoe industrial center there will be much demand and the need for housing in the future. Some of the new business are Clear Capital, Tesla, Switch (a super data center) and much more to come. For more information go to Reno, Sparks, Tahoe Economic Development Authority of Western Nevada. Also, check out Bill’s Podcasts for interviews of leaders across the country and around Reno-Tahoe at Timelines Of Success.